If you like beans, you’re in the right place but you have to learn how to cook them and that’s not difficult! But they are so typically Turkish and so delicious, you’ll feel very pleased with yourself once you have mastered the art of a typical zeytinyağli. Barbunya, the attractive red ones in the picture, are at their height in the summer. They are still available in the markets and greengrocers right now but I notice that the price has started to rise signalling the end of the season is in sight. Fresh is always preferred to dry and they freeze beautifully once shelled, but the dry ones are perfectly all right out of season. 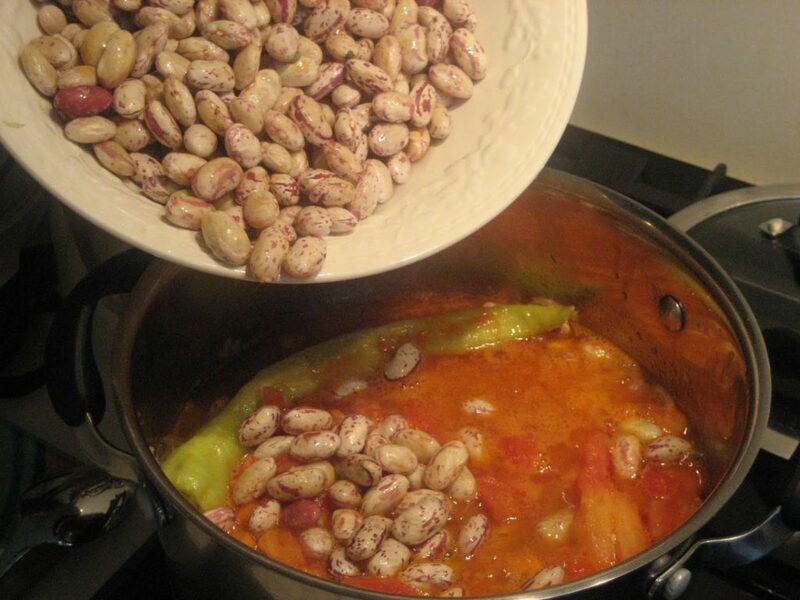 Outside Turkey, roman/red/borlotti beans can easily be substituted. 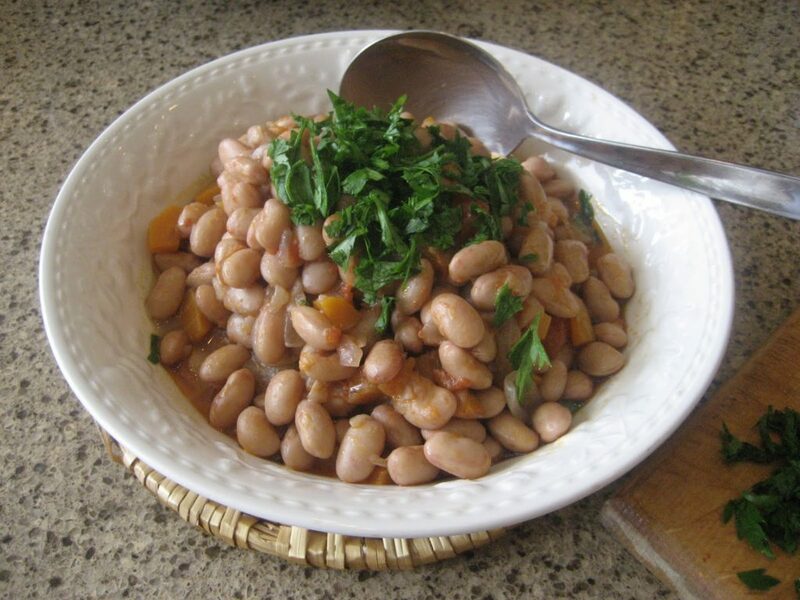 In the US, dry pinto beans, for example, can be used, after soaking overnight. Zeytinyağlı/olive oil dishes – meze – are a staple of local cuisine both in restaurants and at home: Turkish housewives will usually have at least one or two in the fridge at all times, the season dictating which vegetables will be used, while restaurants will have a whole trayful to tempt you. 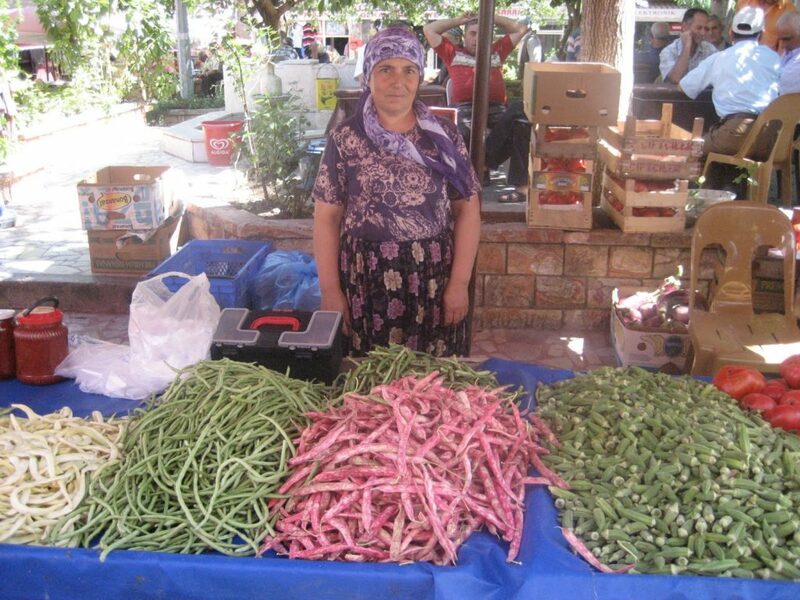 Just about any veg can be used in a zeytinyağli dish: the choice is yours. I have even been served brussel sprouts, which only appeared on the Turkish scene a few years ago, done in this way! One of the best-loved and most common is this one made with barbunya, my son’s all-time favourite: I have just made them twice in 3 days from daughter Ayse’s tried and tested recipe below when he was here for a whistlestop visit. 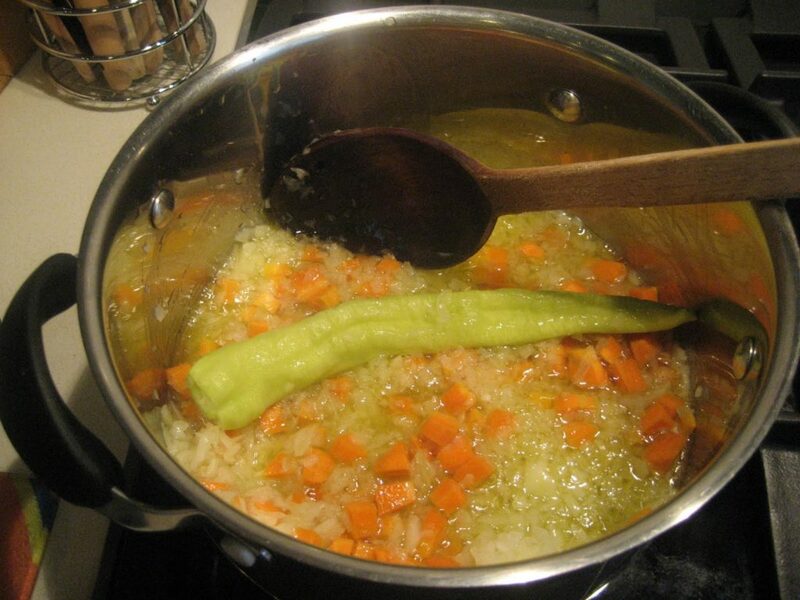 There are many different versions of this recipe, the main differences being in the amounts of olive oil and also sugar. But you know, it is completely up to the cook: if you don’t like using too much oil, nothing drastic is going to happen if you use less. If your recipe calls for, say, a tablespoon of granulated sugar and you don’t like the idea, just leave it out. In time, you will discover how exactly you like your very own barbunya! 1. Heat the oil and add onions to fry gently till translucent – about 5 mins. 3. Add the chopped tomatoes, stir so it is all mixed and cook till the tomatoes ‘melt’. 4. Add the beans and stir the whole lot till mixed. Again, leave to cook for 5 mins. 5. Add salt and sugar cubes and stir. 6. Add the warm water and tomato paste and stir. 7. Then cover with lid and turn the heat down to very low. Set timer for 45 mins. Then check for water at the 45 min mark and have a taste. You are almost certain to find that the beans need to be softer and that you need to add more water (which should be hot). Be careful that the beans don’t stick to the bottom of the pan. 8. Pour onto a platter and when cold, garnish with parsley. 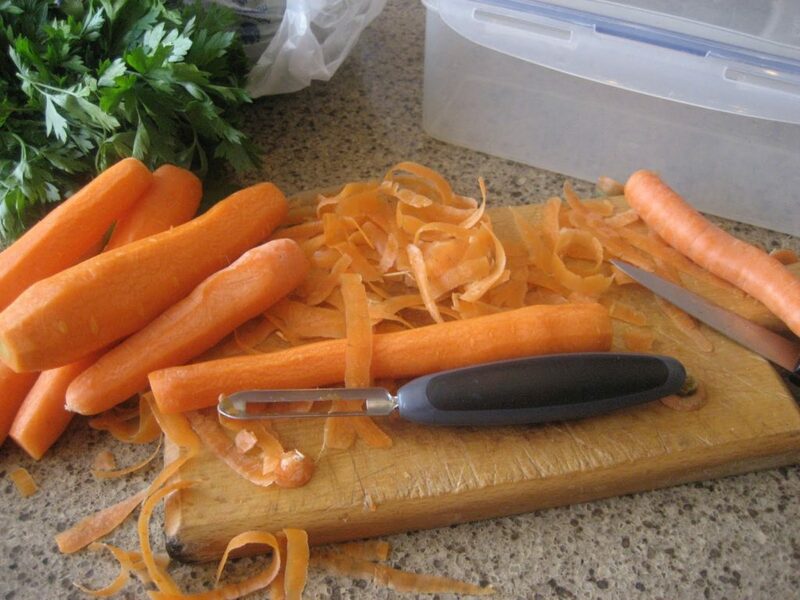 Here is a really great tip for keeping carrots fresh: when you get them home, cut the ends off, peel them and then wash. Put in a plastic container, covering with water, and store in the fridge. They will stay crisp and crunchy for days, all ready for use in cooking or salads. glad you are back online, sis!